Anyway, one of the things that had really interested me from my visit was the plate of traditional sweets I received, as it was a reminder that even if names were different, and languages, the people and food of the Caribbean do share so much! Kokada (the dark brown one), grated coconut in brown sugar glaze (this is the one that tasted like tulum) (the original link seems to not exist anymore, I searched and found this one (not in English). Tentalaria (the white one), ground cashews in a sugar cream (the one that reminded me somewhat of peyra) – try this link (not in English). Another view of the plate. Hope you enjoyed the revisit to Curaçao…or at least the sweets of Curaçao! * yes, yes, this comment was from a year ago, but it’s about time I blogged it! And make my goal of 2 posts in July. This entry was written by Chennette and posted on April 29, 2011 at 9:00 am and filed under Caribbean, food, travel. Bookmark the permalink. Follow any comments here with the RSS feed for this post. Post a comment or leave a trackback: Trackback URL. That photo certainly got my sweet tooth going! I’m a fudgeaholic – there’s a place in West Mall that has them in all sorts of delicious flavours and I try to avert my head when I’m passing by there because once I step inside all is lost. Curacao is one of the most beautiful countries I have ever been to. The people were so friendly and no one made problems. I still remember the sweet houses. All of them had different colours and seemed to be very traditional. Hello and welcome tayanara – I would love to go again to Curacao (when I’m not fasting!) so I can discover more surprises and secrets! Great article which I read with pleasure. Keep on posting these good ones and THANX! The best example of this unique Caribbean style is iguana stew. Prepared just as you would imagine, the dish is a favorite of locals (who say the meat greatly resembles chicken), though it often takes an adventurous tourist to have a taste. Traditional Dutch recipes dating to the early colonial period such as keshi yena – a baked dish with plenty of Gouda cheese, meat and other fresh ingredients – are also popular in many of Curacao’s restaurants. Much to the surprise of many visitors, Indonesian cuisine plays an important role in Curacao’s culinary scene. Brought to the island by the Dutch after establishing colonies in Southeast Asia, Indonesian ingredients and cooking techniques have found their way into many favorite local recipes. One such dish is rijisttafel (Dutch for “rice table”), a combination of rice, vegetables, meat or seafood and the hearty kick of chili peppers. The links in the post are all I know. Hey knuffel – thanks for visiting and for bringing this to my attention. I searched for some new links, but wasn’t always successful. The last 2 I don’t have recipes for, but the panseiku was really just like a brittle and the ko’i lechi was a condensed milk fudge, so you can look for equivalent/similar Caribbean recipes for those things. Those above are really, really sweet! It is my first time to see those sweets and I am craving for it now. Maybe one of these days I’ll go there and not to miss the sweets. 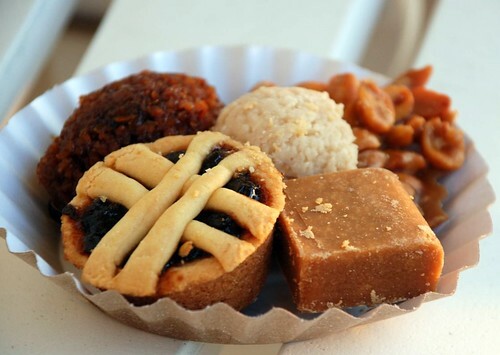 K’oi lechi is one of my favorite sweets in Curacao and they are so easy to make. These sweet little morzels are delicious and addictive, once you have one, you keep on eating……at least if you have a sweet tooth like I do. They bring back good memories of the time that I was there. haha.. yes i am from trinidad and i live here in Curacao and at first when i heard the names of these sweets i thought what is that ?? but when i saw them i said ay we have that in trinidad too but we call it something else. i must say overall Trindiad still has the best food though haha. Somebody need to open a patraj roti shop over here. The roti here is not the same lol. Hi Cynthia. Thanks for visiting! Good to know you had similar reactions 😉 I haven’t been back to Curaçao again to know if these sweets are the same.